The Picts lived to the north of the Firths of Clyde and Forth, mainly in the east and north. It is clear to us today that far from being ‘barbarians’ they were a sophisticated people who, from 500 on, began to adopt the Christianity. St Llolan was a refugee from Wales after the Battle of Chester in 615 when the English slew many monks. He settled at Broughton in the Scottish Borders. His cell was excavated and reconstructed in 1920. St Mungo the 6C bishop was a Briton from the Kingdom of Strathclyde. 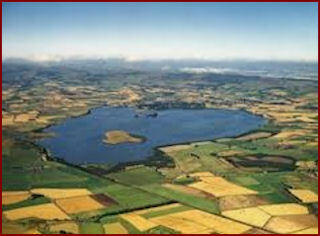 He has eleven dedications in the Lothians on the eastern side of southern Scotland. He is said to have baptised a bard called Merlin of the Woods at Drumelzier on the Scottish Borders. It is not known where St Triduana (Tredwell) came from, though she may have lived as a Pictish recluse in Angus. Her story is that of the beautiful young woman pursued by an unwanted suitor, in this case by a local prince called Nechtan. When she discovered her eyes attracted him she took them out and gave them to him. She continued to live as a virgin at the old village of Restalring now swallowed up by Edinburgh. She had a holy well here and the place became a resort for the blind seeking healing of their eyes. 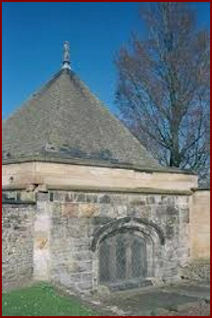 Her reputation may have been widespread, for King James III had a chapel built in her honour in 15C which probably included her shrine. In 1560 the General Assembly of the Church of Scotland decreed that the ‘kirk of Restalrig, as a monument of idolatrie, be raysit and utterlie caste down and destroyed’. It was then used for burials – and as a result very nearly disappeared from view. In 1907 excavations took place of what was believed to be a derelict chapter house. But when 10 or 12 foot of earth, due to the burials, had been removed, a continual water-flow made the excavators realise that they had come upon the well of St Triduana. The well house has now been restored. 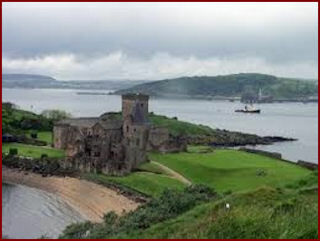 Columban monks from Iona used the Island of Inchcolm in the Firth of Forth for evangelism. The monastery began with hermits and there is a hermit’s cell near the later buildings. Not much is known about St Serf (Servanus) (6C) but he is said to have been the foster father of St Mungo. He is said to have lived in a cave at Dysart (‘desert’) in Kirkcaldey on the Firth of Forth. He is said also to have lived on St Serf’s Island in Loch Leven, later used by reforming monks known as the Culdees – though it may have been a later 8C St Serf than the one above. St Serf is also honoured in West Fife at Dunning, south west of Perth. There is a fine 8C High Cross in the church. The Irish St Kenneth (6C) used the area of St Andrew’s on the coast of Fife as a base to evangelise the southern Picts. We know virtually nothing about St Rule, who is said to have lived in a cave by the shore but his name became involved in the story of the relics of St Andrew. These relics gave rise to the future St Andrews. The Culdees also lived here in 9C when a church was built for them by King Constantine II. Constantine III lay down his kingship to become their abbot. The tower of St Rule’s church stands beside St Andrew’s cathedral. It became a huge place of pilgrimage. There was an early monastery at Dunkeld in Perth which became a daughter house of Iona. Later, when the church was rebuilt in stone, St Columba’s relics were brought from Iona which was very exposed to Viking attack to the relative safety of Dunkeld. They were housed in the Monymusk Reliquary. The reliquary is now in the National Museum Edinburgh. When Nechtan an early King of the Picts (620) lost his Kingdom and was living in exile in Ireland, he sought the prayers of St Brigid. He was restored to his Kingdom. Darlugdach, who was to be the second Abbess of Kildare, came to Abernathy and the King offered it ‘to God and St Brigid’. The Abbess founded a monastery there and sang the alleluias at the offering of the liturgy. A very interesting story. A stone church was built and, later, in 11C, one of only two round towers in Scotland. In 685 the Northumbrians were expelled from the territory of the Picts and a little later both Strathclyde and the Irish Gaels conquered. Constantine (820), Kenneth Macalpin (858), Constantine I (877), Domnall (900) and Constantine II (952) were all significant in the rise of the unified Kingdom of Alba. The 9C however saw several defeats of the Picts by the Vikings and later by the Norse. The Northern Isles and Western isles were lost. St Blane was a Briton from Strathclyde; his uncle was St Catan who had a monastery at Kingarth on Bute. He was sent to Ireland for training and succeeded his uncle as Abbot at Kingarth, and he was made bishop of the surrounding area. Several churches retain his name, not least Dunblane north of Stirling where, about 600, beehive huts were built to continue the work. a fine 10C Pictish cross slab was discovered. west of Dunblane, often called the ‘Gateway to the Highlands’. There is a mound there from which he is said to have preached. 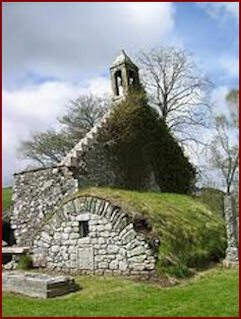 In the Highlands east of Spean Bridge in the Braes of Lochaber, the 7C Irish bishop St Cairell and monk of Iona founded the amazingly remote church of Cill Choirill. The 15C church survived the Reformation and was restored in 1932. The Irish St Bean (720) preached among the Picts of Strathearn (‘valley of the Irish’) using Fowlis Wester, east of Loch Erne as a base. Two 9C crosses have been found here. The 13C church was restored in 1927. St Cuthbert came to Weem, north of Fowlis Wester and lived in a cave behind the church now named after him. The water of his well still flows. But the well is also called after St Adomnan. St Adomnan, the 9th abbot of Iona, evangelised this area and was buried at Dull just 2 miles away where a renowned monastery grew up. Beside the church at Fortingall, just west of Dull and Weem, is a 5000 years old yew tree – said to be the oldest piece of vegetation in northern Europe. Pieces of crosses are to be found in the church. There is also a monk’s bell, probably 7C, one of 5 still found in Perthshire. There seems to have been a lot of activity in this area, no doubt due to the east-west route afforded by Glen Lyon. The surprise is that the church at Fortingall is dedicated to St Cedd the Northumbrian, friend of St Cuthbert, whose cave and well we have just seen at Weem. This only goes to show there is a lot we don’t know about the comings and goings of many saints of the early church. Indeed there were many more saints whose details are now lost. This is a reality of which we need to remind ourselves frequently. The Irish monk St Fillan is said to have lived and died at Strathfillan (‘valley of St Fillan’) north of Loch Lomond. His monastery and pool are to be found nearby. The pool was used for healing the mentally ill up to the 19C. St Fillan also had a cave at Pittenweem on the coast of Fife. Caves are not as bad as we suppose: they were warm in winter and cool in summer and you could always make a ‘door’. Nearby Caiple caves, close to the sea, were also used by early monks. Greek and Latin crosses are found on their walls. The caves were enlarged, and had protective walls to shut out the wind off the sea. Judging by the splendid Pictish stones here there must have been an important Pictish monastery at Meigle. There are many Pictish stones in this area and up to Inverness and beyond. Interpreting them is not easy but they date from the 6-9C when the Picts were Christianised. This is a Christianised Standing Stone at Glamis. 9C St Vigean’s Pictish Stone. There must have been an important monastery here also, perhaps founded by disciples of the Irish St Fechin. This fine battle scene on the left denotes the victory of the Picts over the Northumbrians in 685. The knotwork shows how they learnt from Northumbrian artwork. It is at Aberlemno north of St Vigeans. It is not clear who converted the Picts in the Brechin area but it may have been St Drostan. Old Deer church west of Peterhead in north east Scotland, on the coast of Aberdeenshire, was built on the site of 6C St Drostan’s monastery and used as a base to evangelise Buchan in the North East. St Machar (6C) from Ireland is said to have evangelised Aberdeen. St Fumac evangelised in Moray from 572. The 12C church at Birnie south of Elgin in Moray, north east Scotland, was built on the site of a 6C church dedicated to St Brendan. There was an important Pictish monastery on a tongue of land called Portmahomack (which means ‘my little Colman’s harbour) on the northern shore of Moray Firth. The Irish St Moluag founded a monastery at Rosemarkie on the shore of Moray Firth, north of Inverness. An important Pictish Cross was found at Nigg on the Moray Firth. St Duthac (1065), a bishop, evangelised Tain – this is as far north as we go by land. There was an important Pictish monastery on the Brough of Birsay in the Orkneys. ‘Papar’ is a word meaning ‘father’ and by extension, monk. There are 8 place names of ‘Papar’, Pabbay etc in the Hebrides, 5 or 6 in the Orkneys, and 8 in Shetland. This very suggestive of the extent of the numbers that came here. Papar Stronsay is a remote Pictish monastery in the Orkneys founded after 650. It may have supported hermits who lived as stylites on sea stacks in the Orkneys – several such sites have been found. This is quite amazing. (see the sea stack called ’Bishops Island in Co Clare. It has now (1999) been bought by a Catholic monastic community and is a fully functioning monastery. On Papa Westray in the Orkneys, St Boniface’ church (ex St Curetan, an 8c founder of churches) was probably built on the site of a Pictish monastery. It survived Norse rule and the Reformation. It has now (1993) been restored. There was also a chapel dedicated to St Brigid. From the 9C onwards there were several defeats of the Picts by the Vikings and later by the Norse. The Northern Isles and Western isles were lost. The Norse however became Christian. Their early saints were deemed martyrs, St Olaf (1030) and St Magnus (1116). This splendid stone has been interpreted as ‘Christianity coming to Shetland’ – the Cross, the monks and a bishop (?) on horseback. It may have been part of a shrine. it is now in LerwIck. St Ninian’s disciples got as far as a small island in the Shetlands, named after him as St Ninian’s Isle. The chapel is 12C. Widely known in the Orkney’s he became the patron saint of the Shetlands. There may have been a major Pictish monastery at Papil Burra in the Shetlands, where a beautiful 8/9C Pictish stone was found engraved with monks and croziers. This early Culdee monastery was almost certainly in contact with the Kame of Isbister across Yell Sound. Note the acutely narrow access. Almost as scary a place as Skellig Michael in western Ireland. Papey is a very small island off the south east of Iceland in the Norwegian sea. According to the the Icelandic Book of Settlements, there were ‘papar’ ‘with their bells and croziers’ in Iceland when the Norse arrived. The church below is Iceland’s oldest wooden church. They came to ‘the end of the world’. An incredible achievement and an incredible story. So even today, in the Outer Hebrides, in Orkney and Shetland, places are rebuilt and testify hugely to the Living Tradition in which they stand.